Note: What follows are the notes I wrote up for an educational moment that follows the worship service at Congregational Church of Birmingham, where I am preaching. Pastor Louise Ott and I traded pulpits so she and the Stephen Ministry team at the two congregations could lead the service at Central Woodward Christian Church. 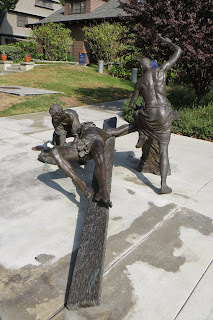 They will do the same next week at CCB, while I will preach the sermon (or a facsimile of it, completing my series of sermons from James, next Sunday at CWCC). TRUE INCLUSION: Creating Communities of Radical Embrace. By Brandan Robertson. St. Louis: Chalice Press, 2018. Ix + 118 pages. Creating truly inclusive religious spaces is not easy. In fact, it may not be possible to include everyone in order to be inclusive (do you include those who disrupt or could cause harm to the community?). Being of the view that it is important to move toward a place of being as inclusive as possible, I am open to hearing from those who have some experience with this calling. While I serve a congregation that chose, after a long journey, to become Open and Affirming, I know that there is much more to learn. 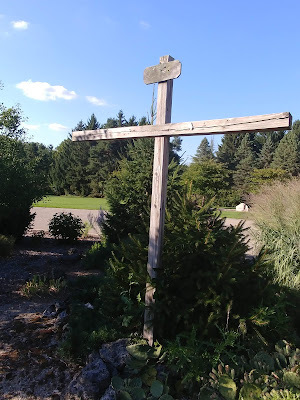 Our pathway proved to be costly, but I think necessary for us to be faithful to our calling. We have moved a long way toward becoming inclusive, but we have a long way to go. Of course, that may be true for all. Today our Bible Study group will work through Daniel 2. In chapter 1 we encountered four Jewish exiles living in Babylon, The four were trained for service in the king's court. All were gifted, but one among them--- -Daniel---had the added ability to interpret dreams. As with Joseph before him, that will come in handy when the king has a bad dream and needs it interpreted. 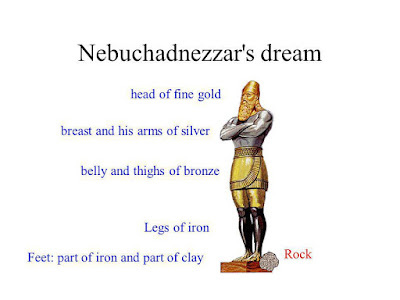 This particular dream features a statue composed of four metals---gold, silver, bronze, and iron---the feet of which is made of a mixture of iron and clay. In the dream, which Nebuchadnezzar wants to have both recited and interpreted (he seems a bit paranoid about being overthrown). Interpreting is one thing, reciting an unrevealed dream on pain of execution is another. All is lost until Daniel gets wind and is brought in to both reveal the dream and an interpretation (though both are gifts of God and not a result of his own powers). As I often do, I am posting an essay published by the Martin Marty Center in their Sightings series. This essay is written by Eboo Patel, the founder of Interfaith Youth Corp. It is, as noted adapted from his latest book, which I have not read. In this essay he speaks of the ways in which the American experience is forming an American Islam, one which recognizes the diversity of Islam, and that while diverse, American Muslims share more in common than they do in their differences. The Islamophobia triggered by 9-11 began the process of bridge-building. The current Trump Administration inspired Islamophobia is encouraging it as well. As a Christian who has significant contact with Muslim friends, I found the essay very helpful. I also take to heart the warning that Muslims will not be the last religious minority to face discrimination. Take and read.